The goal: To drive psyllids below an average of 0.5 nymphs/flush. If the center row has zero nymphs, then a border only treatment between coordinated treatments could be applied to reduce psyllids below this threshold. 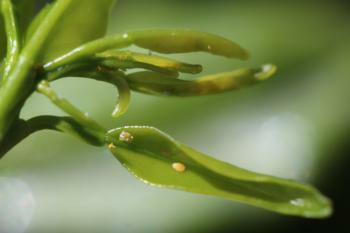 The psyllid prefers borders and so the focus is on the outside edges of orchards. Sample trees each on the north, south, east and west borders (rows/trees) of the orchard and in a center row of the orchard. Borders are defined as breaks in citrus plantings, generally the size of a road. Enter the data on the sampling sheet. 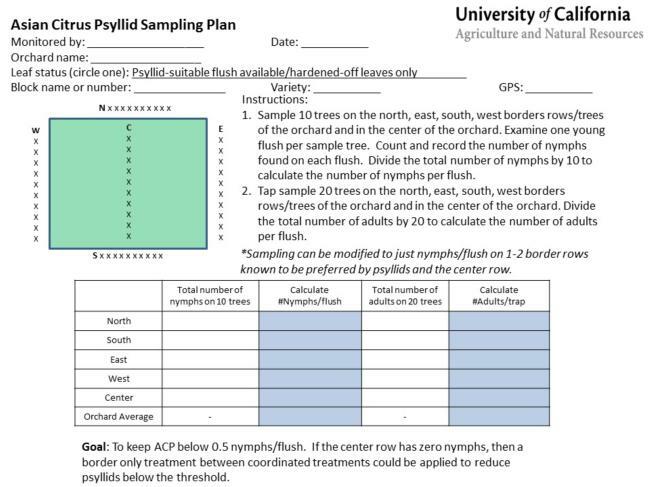 Psyllids prefer certain borders (usually the south and east side), so you could modify the sampling to just two borders and a center row (30 trees) once you know which borders they prefer. Visual Survey of Flush for ACP Nymphs: The best way to find psyllids is to examine new soft leaves as they are developing and look for the nymphal stage with its waxy tubules. The sampling procedure is simply to look carefully at terminals with new flush and count the number of nymphs per terminal in each of 10 trees on the NSEW borders and a central row (total of 50 trees). Tap Sampling for ACP Adults: To sample for adult psyllids, use a plastic white clipboard and spray it with a mixture of a squirt of detergent in a ½ liter of water. ACP knocked onto the clipboard will stick in the solution, giving you time to see, identify and count them. Hold the clipboard under a branch and strike the branch 3 times with a 12” section of pvc pipe (or other device) and count the number of winged adult psyllids collected on the clipboard. Wipe the psyllids off of the clipboard after each count and re-apply the liquid as needed. Repeat this procedure in 20 trees (100 total trees) of the NSEW borders and center row.  To see a video demonstration, click here Tap sample demonstration. Leaf Flush Status: Estimate the number of terminal branches that have feather flush or soft growing flush in a 1/4 meter square area. This provides information about whether there is flush in a suitable state for psyllid nymphs to survive.